Fill four test tubes with water. Into each, put one drop of food coloring (use red, yellow, and blue). Stir carefully by tapping your finger on the test tube. Pour half of one color into one of the empty test tubes. Pour half of another color in on top of it. Stir carefully. I think your idea about mixing primary colors for kids in test tubes is great! I think kids should be taught a little more clearly about the primary colors than we usually are, though. 1. A primary color cannot be derived from mixing other colors together. 2. The primary colors can be combined to make all hues. In particular, Red, Yellow, and Blue are a set of primary colors. The purple and blue-green formed by mixing these colors is very dark. If you want a strongly saturated, bright magenta or cyan, there's no way to get it by mixing these three colors. On the other hand, mixing magenta and yellow can in fact produce a very nice red pigment. And mixing cyan and magenta makes a perfectly good blue pigment. By mixing with a little black you can also get the dark magenta and dark cyan that one could get mixing red, yellow, and blue. What this amounts to is that the best primary colors, the ones able to produce the widest range of colors, are yellow, cyan, and magenta. These mix to form red, green, and blue. So why do we say that red, yellow, and blue are the primary colors? Well, if you look at a print cartridge and you don't know the proper terms, you would probably call cyan a type of blue and magenta a kind of red. More fundamentally, the cells in the eye respond to four kinds of hue: Red, Green, Yellow, and Blue. So in a way these are the most intense sensations, and they act as attractors to color names. Notice that cyan and magenta are very bright colors. Mixing two bright colors always gives a darker color in pigment space. So I say children should be taught in preschool that cyan, magenta, and yellow are the primary colors, and these mix to form red, green, and blue. 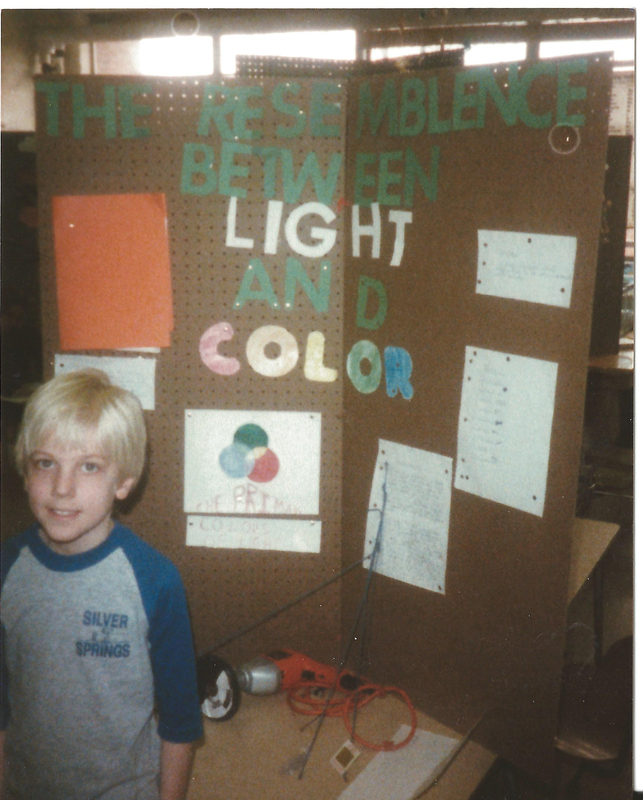 Here's a picture of me learning about mixing colors as a 4th grader. Thanks for the comments. The picture of the science project is great. I love that many of our science projects weren't as highly refined in the presentation portion but had awesome bits tossed in like power tools. I use the CIE 1976 http://en.wikipedia.org/wiki/CIELUV color space to describe the emission of my polymers. I hadn't thought about multiple primary colors before, I knew they existed but I hadn't thought about what it took to be a primary color. I'm using RGB because that is what the most common food colors come as. If you try it one thing you may notice is if left in the window sill the purple will slowly shift red because the blue is absorbing higher energy light and breaking down faster.